Delicious round packets of soft, golden fried bread, wrapped around a rich, melting feta cheese filling.. A match made in heaven! Tiganopsomo (fried bread) is a very easy and versatile traditional Greek dish perfect for every time of the day, that can be served as starter or side to savoury dishes or stand on its own as a filling mid day snack. Most countries have a version of fried bread or some kind of pan fried dough flatbread. The Greek version of fried bread is called Tiganopsomo and is the most delicious result of a handful of plain ingredients there will ever be! Tiganopsomo (Greek fried bread) takes its name from the word pan or fried in a pan ( ‘tigani’ or ‘tiganizo’) and bread (‘psomi’). To prepare this Greek fried bread recipe, all you need is some kind of bread dough rolled out flat and fried in just a little oil and of course some good quality Greek feta cheese. In lots of Greek households this kind of fried bread is prepared with leftover dough from traditional savory pies or breads and although it may have a slight different taste and texture it still tastes delicious! When preparing this Greek fried bread recipe, let the dough rest for a while to be easier to roll. Roll the dough about 0.5 cm thick, because if the dough is too thick it may not cook inside. Be careful not to add too much feta filling as it will be more difficult to flip the fried bread sides when frying. And lastly make sure to seal really well the edges of the dough as shown in the preparation photos bellow, or else the feta cheese may melt outside of the fried bread into the pan! Most of the times Greek fried bread is filled with crumbled feta cheese or a combination of feta and Greek hard yellow cheese, like Graviera for a more melty texture. Depending on what you have in hand you can also use for the filling of the fried bread some fresh herbs, like oregano, mint or dill for extra flavour. Serve this extra tasty Greek fried bread while still warm as a filling veggie mid-day snack or starter with a Greek salad aside. Enjoy! 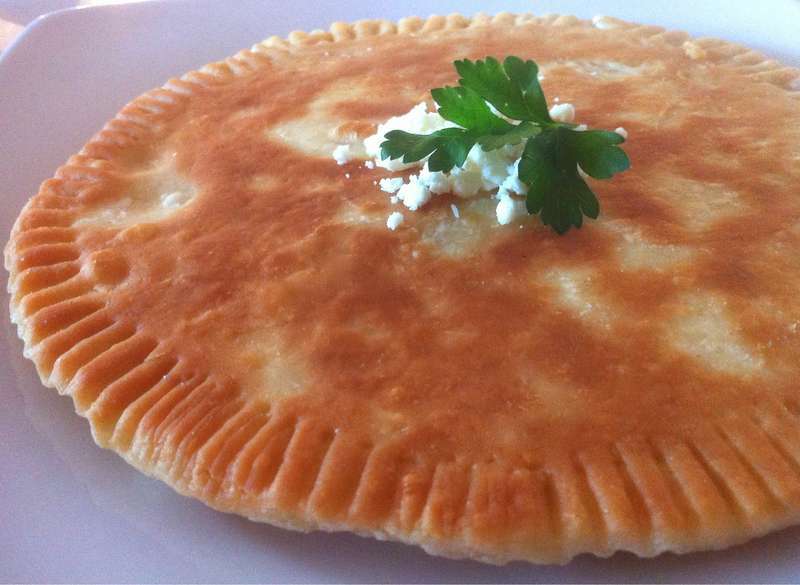 To prepare this delicious fried bread with feta cheese (tiganopsomo), start by making the dough. Add the flour into a large bowl; using your hands make a dimple in the middle and add the salt, the sugar, the yeast and pour in the olive oil. Knead the dough with your hands adding slowly the lukewarm water, until the dough becomes smooth and elastic and doesn’t stick. Cover the dough for the fried bread with some plastic wrap and let it rest for 30 minutes. Divide the dough in 4 pieces. Roll the pieces of the dough into circles, approx. 0.5cm thick (that can fit your frying pan). Top two circles of dough with crumbled feta cheese and cover with the other circles. Join the edges well, using a fork. Heat a large frying pan to medium heat and add enough oil to cover the bottom of the pan. Fry the breads, until nicely coloured; when one side becomes golden, turn them on the other side. Remove the fried bread from the pan and place on some kitchen paper to absorb the extra oil. Enjoy while still warm!